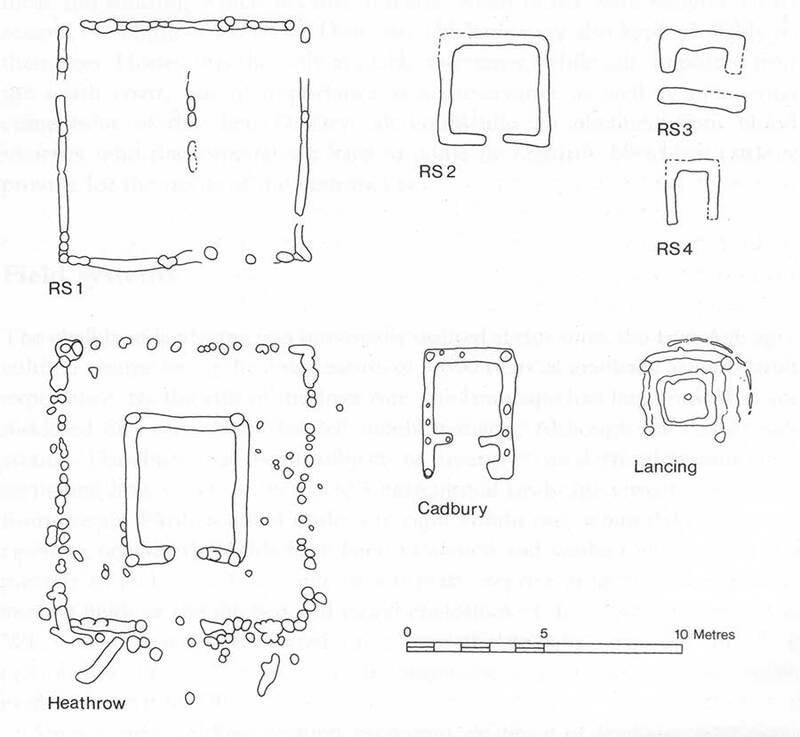 In the centre of Danebury Ring there is a group of four rather unusual rectangular buildings (see image 01). They face towards the entrance of the hillfort and are sited on the false summit of the hill, that is the area that appears to be on the skyline when viewed from the entrance but is in fact not the true crest. They are also aligned with the pathway running directly towards the main road and the east entrance. One of the buildings, RS1, lies astride the path and seems to have been some kind of fenced enclosure, quite possibly unroofed. Image 01 – General plan of the central area showing the four ‘shrines’. All that can safely be said about it is that it is probably the latest of the group. The other three buildings were clustered together on either side of the path. Since all of them are related in some way to pits containing datable pottery (some pits are earlier than the buildings and some later) the buildings can be approximately phased. RS3 and 4 were probably laid out together first in the early or middle period of occupation while RS2 was added later, but the fact that its fas;ade lines up with RS4 suggests that RS4 may still have been standing when RS2 was built. All these buildings were probably constructed in the same way but the details are clearest in RS2. Image 02 – Building RS2 before excavation – note how the wall slots had cut through the tops of filled-up earlier pits. The first stage of the archaeological excavation entailed the very careful clearing of the surface of the filling of the wall trench, which had been cut into the chalk, and the top of two filled-up pits. The clearing showed two very distinct layers: a chalk rubble packing against the outside of the trench edge; and a far more soily band against the inside. When this stage of the excavation had been planned and photographed, the filling was carefully dissected leaving a number of vertical sections which were all drawn. The best preserved showed clearly that the difference in the fillings noted in the surface clearing also appeared in the vertical sections. The simplest explanation for these observa­ tions is that the soil represents the position where the ends of thick timber planks had once stood, packed tightly into position by the chalk rubble. When the timbers had finally rotted, soil washed in to fill the voids thus created. If this interpretation is correct then we must imagine buildings with solid plank walls and presumably simply gabled roofs of reeds or thatch. 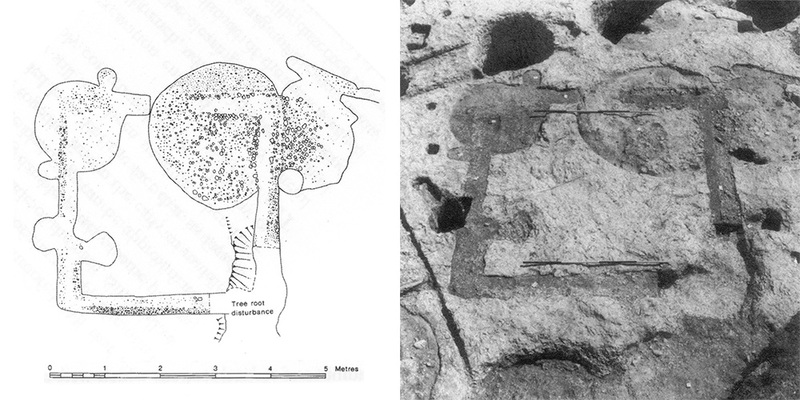 Image 03 – Building RS2 after excavation – note how the wall slots had cut through the tops of filled-up earlier pits. It is one thing to describe structures but another to explain their function. There is nothing associated with the Danebury buildings to give any indica­ tion as to how they were used, but the general type has turned up on Iron Age sites from time to time (69). 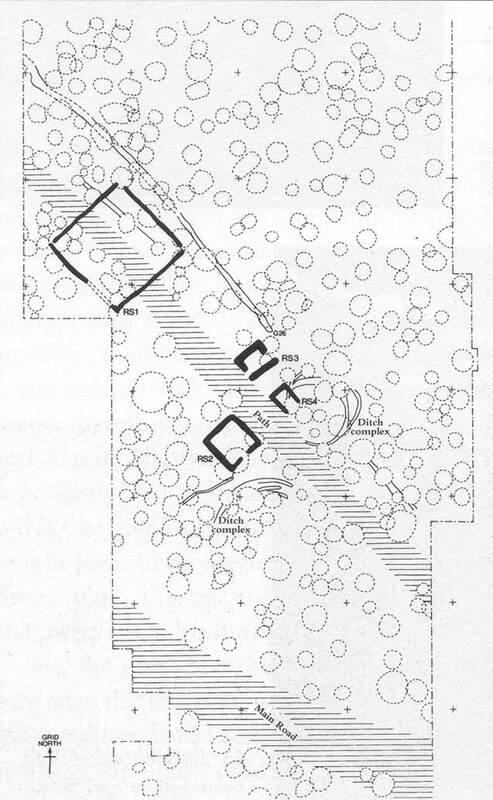 At South Cadbury, for example, a not dissimilar structure was found in a prominent position at the end of a path lined with animal burials, suggesting to the excavator that it may have been a shrine. More recently a building of the general type has been found at Lancing, on a site later to be occupied by a Romano-British masonry-built temple, again empha­ sizing possible religious connotations. Even more dramatic was the discovery of a complex building at Heathrow. It looks very much like a combination of RS1 and RS2 from Danebury and in general plan is identical to a widespread type of Romano-British temple. Together, then, the available evidence points to a religious use for these structures. Their dominant position in the centre of Danebury Ring and the fact that at least one of these buildings was in use throughout much of the life of the fort adds further support to the hypothesis.